Dubai: Over the years, many researchers have studied the 10,000-step number to see if it holds weight. The answer is yes, and no. Although 10,000 steps is not universally appropriate for all ages, genders and levels of physical function, it is considered “a reasonable target for healthy adults,” according to a 2011 research review published in the International Journal of Behavioural Nutrition and Physical Activity. Here’s why: Most people take 4,000 to 6,000 steps through general daily action — working, shopping, walking through parking lots, etc. If you add the 30 minutes of recommended exercise, that’s another 3,000 to 4,000 steps, and gets you close to the 10,000-step goal. It’s basic maths. Keeping track of steps can prompt people to do more activity using manageable goals. But does that mean that using a step counter improves your health? Research shows mixed results. Benefits could include increased physical activity and motivation to exercise; reduced anxiety and better mood; and improved glucose tolerance and blood sugar levels. The trend has numerous health benefits such as weight management, decreased blood pressure and increased cardiac output. Put simply, you will become a healthier, fitter version of you. 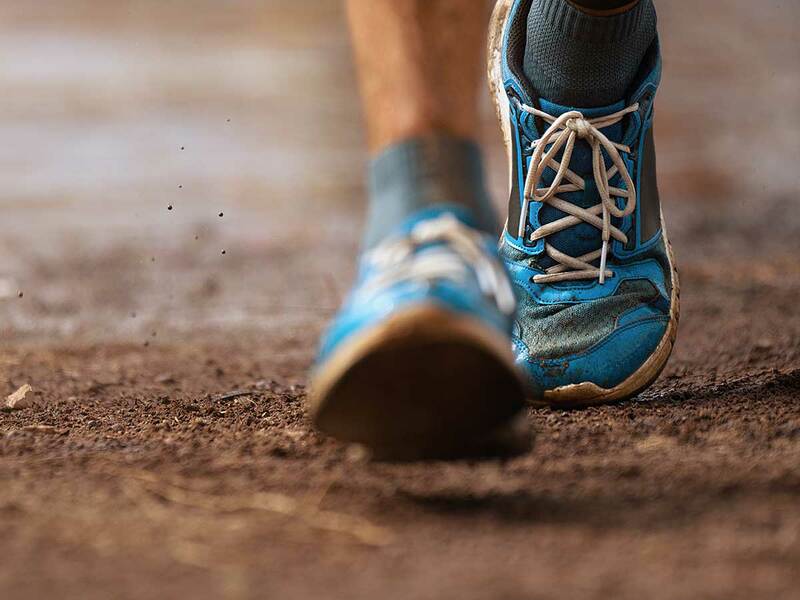 Although some studies show that step counting can help control blood pressure levels and reduce body weight, at least in the short term, other studies have shown this is not the case. Recent studies are looking at the risks that come from too much sedentary behaviour, especially on cardiovascular disease risk. Rob Willoughby, Senior Personal Trainer at Fit Squad DXB, outlines the myths and facts about the 10,000 steps trend. “The trend has numerous health benefits such as weight management, decreased blood pressure and increased cardiac output. Put simply, you will become a healthier, fitter version of you,” says Willoughby. “The scientific basis behind this trend is derived from the principle known as Non-Exercise Activity Thermogenesis also known as NEAT,” says Willoughby. “This is the term given to everyday activities that expend energy excluding planned workout sessions. Researchers at Stanford University performed a meta-analysis from 26 studies with the objective to evaluate the association of pedometer use with physical activity and health outcomes among adults. Is 10,000 steps for everybody? “Regular walking will most definitely have some form of positive impact on everyone’s health and well-being. That being said, some simple precautions should be taken if you considering taking up the challenge. How many steps does a normally active person take a day? An active person will on average complete a minimum of 7,500 daily steps, whilst completing less than 5,000 daily steps could be considered sedentary. Are age, health condition and other factors important when assessing the number of steps? Absolutely. Health condition and lifestyle factors should always be considered. How many steps should not be a focus point. The goal must be to gradually increase your daily energy expenditure over time. 10,000 steps is just a target to aim for further down the road. Start with a manageable goal. For example, you could focus on completing a 10-minute short walk three times a day and as the weeks progress, start to increase the duration of your walks. The UAE weather can make it challenging but think about using a treadmill or walking in malls or indoor track during summer months. “For office workers, it can be a challenge but I can’t stress how important it is to keep moving. One simple tip is to set a regular 60-minute timer to remind you to get up and complete a couple laps of the office and watch your step count rise. For those of you not counting steps, simply focus on completing your short office walks. By implementing this simple strategy you will reap the benefits,” says Willoughby. They are really both similar tools to achieve the same goal of increasing daily activity by walking more. Pick which one works best for you. Some people love to use tech and measure their steps and some people hate it and that’s absolutely fine. Whichever the approach, you are still doing exactly the same thing — moving more. This is your own personal journey — don’t feel pressured to keep up with someone else’s, says Willoughby. 1. The quality of the physical activity matters more than the actual number of steps that appears on your pedometer. Getting 10,000 steps from window shopping isn’t as beneficial as a brisk walk. Your pedometer counts them equally, but your body doesn’t. Quality steps should focus on both the intensity (brisk walk vs. casual pace) and the cadence (number of steps per minute). To be truly active, aim for at least 100 steps per minute. Not sure how fast you walk? Use the timer on your phone to help you set a healthy pace. 2. There will be days when you fall short of your step goal, and days when you surpass it. Make sure that you will be mentally prepared for either outcome before you start tracking. If step counts become too difficult to meet and make you feel bad about yourself, it’s not the right plan. Physical activity should be enjoyable and motivating, not stressful and harmful. 3. Step counting isn’t a complete picture of how active you are. Pedometers don’t measure physical activities such as biking, yoga or swimming, and can give an inaccurate count unless you have them with you at all times. It is important that you consider 10,000 steps as a guiding value, not a prescriptive one. It compares well to estimating daily calorie needs — there’s no commonly shared number for everyone. And, as with calories, it’s best not to obsess over figures when tracking steps. 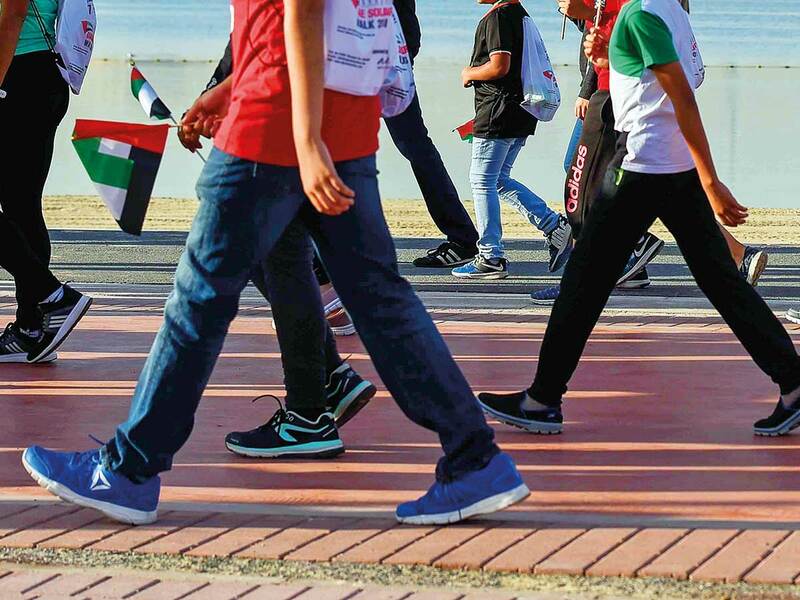 According to Dr. Krishna Prasad Meda, Consultant Orthopaedic Surgeon and Sports Injury Specialist, Burjeel Hospital, Abu Dhabi, “6,000 to 8,000 steps are recommended for healthy adults. Persons over 40 years should start [with step counts] that is comfortable for them and gradually increase the number of steps to the desired level. Before you start increasing steps it is important you see your family physician who will check your blood pressure, diabetes status and cholesterol. Keeping healthy is a combination of good diet, exercise to keep you active and flexible, proper rest and adequate sleep and control of stress levels. “20 minutes of brisk walk will roughly give you 3,000 steps. A moderate increase of heart rate with brisk walking keeps your heart healthy," said Dr. Meda. "There is no reason to feel bad about yourself (if you don’t complete 10,000 steps a day). You do not need to do it every day either if it does not fit into your lifestyle. Who started 10,000 steps a day? This trend dates back to 1965 in Japan where Dr. Yoshiro Hatano began selling a pedometer known as manpo-kei (10,000 steps meter). Based on Dr. Hatano’s calculations, walking 10,000 steps a day could burn up to 20 per cent of a person’s daily calories. His research team determined that the average Japanese adult completes 3,500-5,000 daily steps. They concluded that if people could increase their step count to 10,000 steps a day, they would become healthier. I have come across this regimen. However, I don’t follow it as such, mostly due to lack of time and I feel it’s an unrealistic goal for most people. On an average, I probably take just above 5,000 steps a day. I think we should find a balance between healthy eating and exercises as it’s an effective way to remain healthy. One must lean more towards a vegan lifestyle and keep track of our eating habits. Exercising on a daily basis can energise and rejuvenate the body. I believe exercising for at least 30 minutes a day is imperative. No. I haven’t heard of this trend. On an average, I probably cover about 4,000 steps a day. It might be more on certain days and vice versa. I think one must pay attention to the demands of the body and ensure that we work towards a routine that fits our lifestyle. I believe that meditation is good for health and it’s also important to follow the right diet. Walking is usually the easiest form of exercise, so it must not be ignored but it’s also good to set more realistic health and fitness goals, taking into consideration one’s age and lifestyle. I have come across this regimen several times, however, I don’t really follow it as I believe that eating healthy is more important for the body than following such trends. Having said that, since I am a university student, I still rack up about 9,000 steps on an average. Sometimes, I hit the 12,000 steps a day mark. Most of it is due to walking and playing sports like soccer. I prefer maintaining a proper diet and playing some form of outdoor sports to remain fit and healthy. I’ve heard of the 10,000 steps a day trend. I try to follow it, I even purchased a Fit Bit to record my daily steps. I try to follow this routine most of the time, but it gets a bit difficult to maintain during weekends as I like to spend my weekends at home. On an average, I usually manage around 7,500 steps a day in my effort to keep fit. However, I feel sometimes this milestone of 10,000 steps a day is unrealistic and is not a criteria to decide if someone is fit or not. Regular exercise and eating healthy foods should suffice. Moreover, yoga is also beneficial to the body and mind and can be used as an effective form of exercise.